HMP Greenock recently hosted a collaborative project in partnership with the Beacon Theatre called “Hidden”. 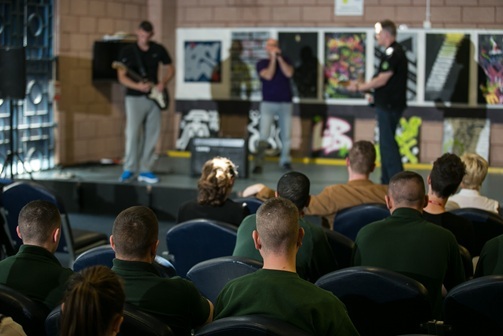 The Hidden project team in conjunction with the Learning Resource Centre delivered a short concert to a mixed audience of prisoners and official visitors on Friday the 24th of July. The participants in the concert were selected from all areas of the establishment including male, female, long and short term offenders. The show involved music, dance and art and involved personal experience from those participating to show the high price paid by them following their offending behaviors. The material will be used along with art work and recordings from other artists to show potential offenders around “hotspot” areas in Inverclyde the consequences of poor decision making and the effects criminality can have on long term life. Fraser Neilson, Acting Head of Offender Outcomes commented that the show was well received by all in the audience and the organisers were both impressed and grateful for the level of commitment and quality of participation from all involved.